The pressure is on. Your responsibility as the organization’s marketing leader is to ensure your sales pipeline is continually full of sales qualified leads in order to meet sales goals. No doubt, you have the traditional marketing tactics down for lead generating and nurturing. But is it enough to keep your pipeline full? Especially when, regardless of whether you are a B2B or B2C business, the majority of potential customers begin their search for products and services online. Only 29% of people want to talk to a salesperson when learning about a product or service, and 40% of salespeople say getting a response from prospects is getting more and more difficult, according to the HubSpot 2018 State of Inbound Report. This is where automated lead nurturing, an inbound digital marketing strategy, comes into play. Through the use of automated workflows, emails are sent to your audience with the right messaging and information that matches where they are at in the buyer’s journey. Automated lead nurturing is a way for you to keep your leads engaged with educational and informational content, which then helps them learn more about your services. As they become ready to consider your service, you can qualify them and turn them over to sales. Companies that excel at lead nurturing generate 50% more sales qualified leads at 33% lower cost, Forrester Research found. 79% of B2B marketers credit email as the most effective distribution channel for demand gen efforts. Companies that automate lead management see a 10% or greater increase in their revenue in as few as 6 months, according to Gartner Research. The immediate benefits of automated lead nurturing are improvements to process efficiency, flexibility and creativity. Automation provides the digital infrastructure that allows marketing and sales to interact with buyers in a personalized way. How much revenue would you gain if you could capture 1-3% of your lost leads? 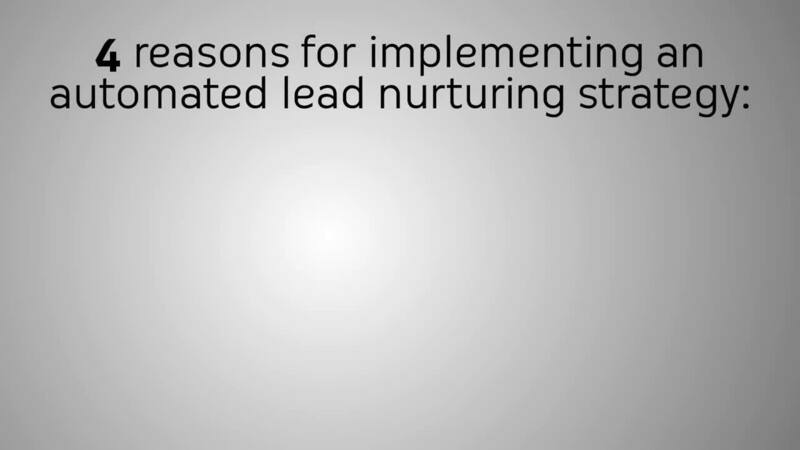 How much time could be saved by automating manual lead nurturing tasks? How much could we reduce spend through automated and targeted campaigns? How much could we improve efficiency and productivity by integrating sales and marketing systems? Today’s buyer is tech savvy and smart. That’s why today’s fastest-growing companies are using inbound digital marketing strategies such as automated lead nurturing to increase sales and grow revenue.